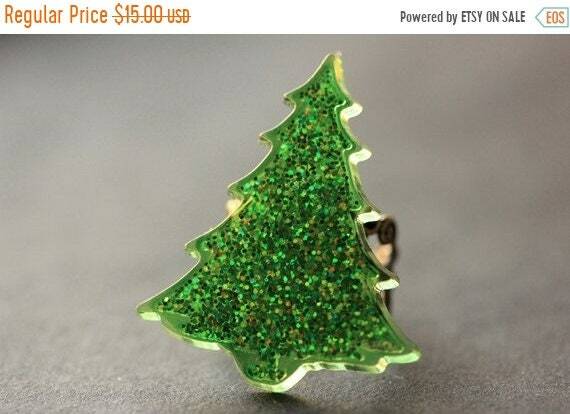 A bright green Christmas tree button, created from shimmering bright green glitter caught beneath resin has, re-purposed in this handmade ring when set upon an adjustable ring base in bronze tone filigree designed to be adjustable from size 6 and up. The base for this handmade ring is adjustable, which makes this delicate filigree ring comfortable no matter the size of the wearer's fingers (size 6 and up) as well as ideal for switching from finger to finger depending on mood or preference. EASTER SALE Holiday Ring. Christmas Tree Ring. Christmas Ring. Silver Filigree Adjustable Ring. Handmade Jewelry. EASTER SALE Red Christmas Present Ring. Holiday Ring. Christmas Ring. Bronze Filigree Adjustable Ring. Handmade Jewelry. Christmas Tree Ring. Glitter Ring. Christmas Ring. Holiday Jewelry. Green Tree Ring. Bronze Ring. Adjustable Ring. Christmas Jewelry. EASTER SALE Christmas Holly Ring. Holiday Ring. Christmas Ring. Silver Filigree Adjustable Ring. Handmade Jewelry. EASTER SALE Holiday Ring. Teddybear Ring Christmas Ring. Teddy Bear Ring. Christmas Jewelry. Adjustable Ring. Holiday Jewelry. Bronze Ring. EASTER SALE Christmas Ring. Stocking Ring with Gingerbread Man. Holiday Ring. Bronze Adjustable Ring. Handmade Jewelry.